Many of our members are affiliated with the larger military community in San Antonio. When researching this summer's charity sewing challenge, I found Health Care for Homeless Veterans (HCHV), which is party of the VA system. After talking with the coordinator, Peggy, we determined that a tote bag for their supplies might be a perfect fit. 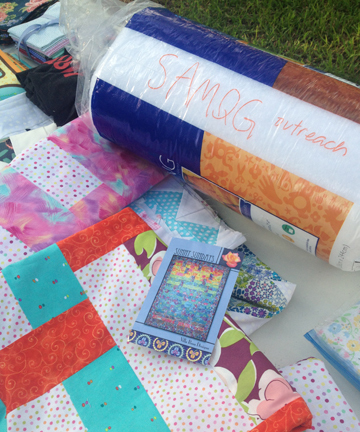 The SAMQG is hosting a challenge to create a tote bag. The goal is to create 100 bags to be presented to HCHV in September 2016. That gives us May, June, July and August to stitch. How do you make a tote bag? If you have found a different internet tutorial (for non-restricted use: meaning you can make a ton of them for charity) or have a favorite style of tote bag to sew, you can make it, too. Make what you feel comfortable making. Our goal is simply to provide tote bags. Yes! 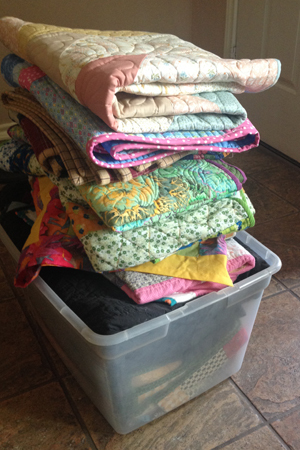 We are very fortunate to have fabric donations and generous members. Kits will be available at the Sew-In's and at SAMQG meetings throughout the summer. Kits will be cut for the Morsbag requirements. 1 rectangle of fabric measuring 18" x 40"
2 rectangles of fabric measuring 18" x 4"
Of course, you are encouraged to sew as many tote bags as you like on your own, too. You do not have to attend an event to make a wonderful donation. GRAB THE PATTERN HERE. 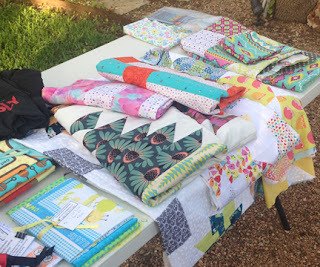 Since January 2016 the San Antonio Modern Quilt Guild has been collecting and creating these quilted donations. 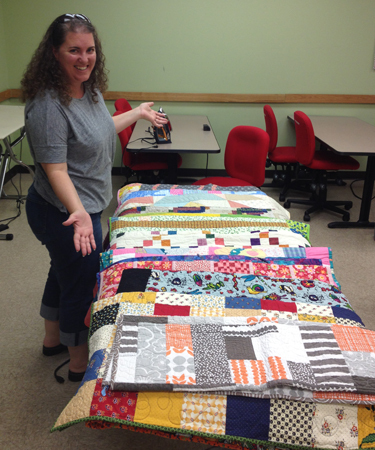 Through independent member donations and through our Revolving Charity Table, I'm thrilled to report that 13 quilts were donated to Quilts for Kids! 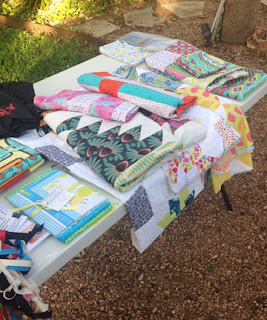 The drop-off location is Sew Special Quilt Shop on 1604. I took the quilts to the shop today. The shop owner, Laurie, was happy to receive them! We laid them out in their classroom to grab a photo of the collection together before they head to their new homes with Santa Rosa Children's Hospital. As it turns out, the outreach/charity collection bin is empty now. I know our generous membership will be filling this tote up over time. You did amazing work! 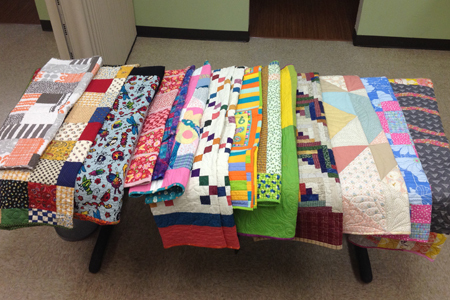 Bring your donations to the quilt guild meetings or simply take them to the quilt shop. Your work is appreciated! What is the Revolving Charity Table? Well, I'm so glad you asked! In short, it is the ultimate outreach group project. Our guild takes unfinished donations (in all stages) from guild members and allows other guild members to work on them. Patterns & Fabric: If you have a pattern or fabric kit that you've purchased or cut and are no longer interested in making, bring it to the guild. We have a members that love piecing and just want to give that a try. Quilt Tops: Did you make a top that you are no longer jazzed about? Bring it to guild. 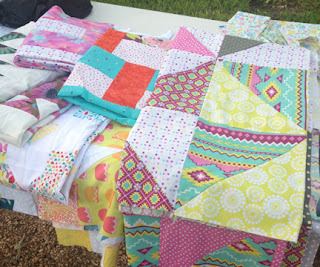 We have members that love the quilting step but don't have desire or time to piece a top. We have supply donations as well. Rolls of batting and easy pattern cards have been donated for our guild to use as we finish up projects on the Revolving Charity Table. Binding: If you have *mostly* finished a quilt and it needs binding, bring it. Folks enjoy that final step, too. Fun fact: There is no timeline for completing the item you take. We do ask that you work on it and finish it to the stage you are comfortable. There isn't a "it has to be turned in next month" type rule. Take two or three months, that is ok. Just be sure you return what you take. At the next meeting, dive in and give the Revolving Charity Table a try. We are happy to hold the items from month to month and are even happier to receive finished projects which have been stitched by a few members.